Forget messing with multiple pots and pans... Recipes made with a single sheet pan are where it’s at! 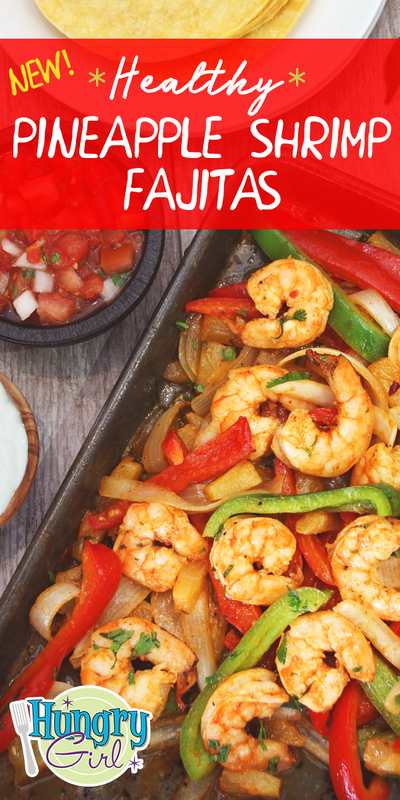 Today’s fresh spin on shrimp fajitas is perfect scooped into corn tortillas, piled onto a green salad, or enjoyed over a bowl of cauliflower rice. Dig in! In a large bowl, combine veggies, pineapple, 1 1/2 tsp. fajita seasoning, and cilantro. Toss to coat. Spread mixture onto the center of the baking sheet. Bake for 12 minutes. Meanwhile, in the large bowl, combine shrimp, lime juice, and remaining 1 1/2 tsp. seasoning. Toss to coat. Flip/rearrange mixture on the baking sheet. Top with shrimp. 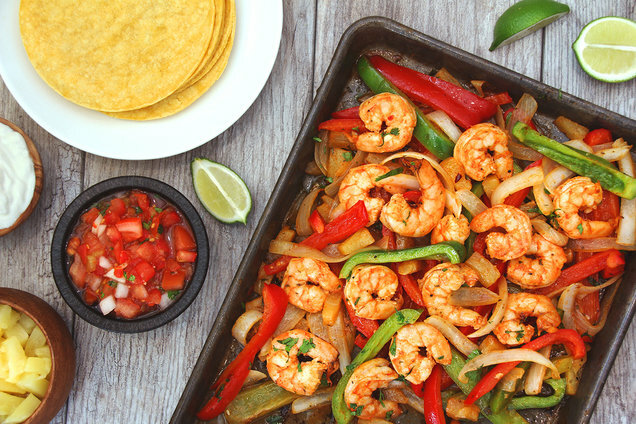 Bake until veggies have softened and lightly browned and shrimp are cooked through, about 8 - 10 more minutes. 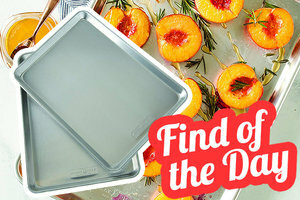 The number-one deterrent to making easy sheet-pan meals might be that warped and rusted baking sheet you’ve had since the early ‘00s. These Nordic Ware Natural Aluminum Commercial Baker's Half Sheets are here to save the day. They’re big enough for loads of food, yet they fit perfectly in a standard oven. Plus, they’re designed to withstand rust and warping, and they have a massive 5,500+ reviews with an average of 4 1/2 stars! Go ahead... Treat yo’self. Hungry for More Healthy Sheet-Pan Meals? Enjoy your fajita fiesta! FYI: We may receive compensation from some of these links. Happy Snack a Pickle Day (September 13th)! Sure, you could eat them straight from the jar… but why not snack on these Faux-Fried Pickle Chips? Help your pals make easy meals -- click "Send to a Friend" now.